For months Wolf's campaign has tried to portray Roberts as more in tune about Washington than Kansas, pointing to reports from earlier this year that the three-term senator listed his voting address at the home of two longtime political supporters who rent out a room to him. Roberts owns a rental property in his hometown of Dodge City and a home in the Washington suburbs, where he spends much of his time. Asked about his residency during an interview on Thursday with talk radio station KCMO in Mission, Kansas, Roberts said: "Every time I get an opponent – I mean, every time I get a chance, I'm home." The Wolf campaign was quick to capitalize on the comments by Roberts, and CNN has learned that starting Tuesday they will run a radio spot statewide that uses the Roberts audio clip three times in the one-minute long ad. 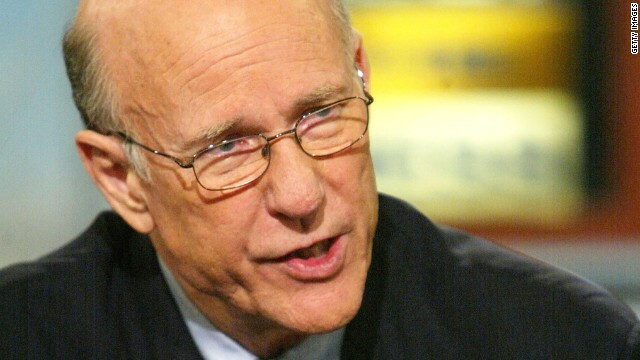 "Pat Roberts left us a long time ago, and now we need to bring him home … wherever that is. Because nobody should spend 47 years in Washington," adds the narrator in the spot. The Wolf campaign went up with a radio spot back in February that also questioned Roberts' ties to Kansas, after the controversy over the senator's residency was first reported. The Roberts campaign was quick to minimize the Wolf campaign's new ad buy. "Milton Wolf touts"statewide" radio ad. Reality: 6 ads totaling $2,000. Another Wolf untruth," wrote Roberts' executive campaign manager Leroy Towns, on Twitter. Meanwhile, the Roberts campaign announced Monday that it's going to re-run statewide on broadcast and cable TV an ad that highlights old Facebook postings from Wolf in which the radiologist exposed private patient X-rays and other personal information - poking fun at the dead or wounded. Wolf was forced to admit he made "insensitive" comments. "Dr. Milton Wolf's patients trusted him, but stunning news reports show that Wolf exposed private patient X-rays and other personal information on Facebook – where Wolf relentlessly poked fun at the dead or wounded. A Kansas City medical ethics expert called Wolf's behavior 'beyond alarming' for a professional in the field of medicine," says the narrator in the 30-second spot. A second cousin (once removed) of President Barack Obama, Wolf paints himself as a conservative activist with the guts to stand up to the GOP establishment. As a doctor, he frequently campaigns against the Affordable Care Act and proposes his own plan that he calls "PatientCare." A leading national tea party group, the Tea Party Express, is holding a rally for Wolf on Thursday in Topeka. Polls suggests Roberts is the clear favorite over Wolf in the August 5 GOP Senate primary. Here's how you resolve questions over someone's residency. You look at their federal tax returns to see what address they have listed, and check to see whether or not the listed address is valid. If he rents a room somewhere in the state and lists that room's address as his official home, then all is in accordance with the law. The U.S. Constitution defines the minimum requirements to be a U.S. Senator, which states can then expand on. I think that the Constitution defines the only requirement as being that you need to own property, which would seem to completely exclude renters. That doesn't sound fair to me. I'm sure many will vote against him just because President Obama is his cousin. "A leading national tea party group, the Tea Party Express, is holding a rally for Wolf on Thursday in Topeka." If you wish to be the unthinking tool of a couple of insane oil barons whose every move is strategically planned to increase their own bloated wealth at ANY cost to the average American taxpayer, then join tom i and his klan of ruffians who are willing to tell any lie, distort every fact, and carry water for their masters every single day on here. "A Kansas City medical ethics expert called Wolf's behavior 'beyond alarming' for a professional in the field of medicine," says the narrator in the 30-second spot. Which leads to the question: "what would be considered 'beyond alarming' for a professional begging to be voted into the professional field of, say .... Senator of the United States of America"? Yet, here is the Tea Party ... ready and willing to help vote this guy in; for the cause, yes ... but perhaps NOT for America. "Close the border." Then fund the border closing. "not paid for it" Insurance have been publishing figures for months showing millions of new paying customers. Yes, there are many people who have been picked up through the expansion of Medicaid, but even many of those people are receiving assistance in the form of a subsidy, and THEY PAY THE REST. Give it a rest. The Republican leadership has. They've figured out that campaigning against a successful health care law is a non-winner. When was the last time you heard someone in the Republican leadership talk about Obamacare. It's been a few months. Not since the enrollment target was met. "Look at the facts, those job losses were after the Democratic Party took over the House and Senate and started to implement the economy policies from the Democratic Party. You can subtract one for Mitt Romney as part of the non-working demographic. You still have to account for 50 million plus people on food stamps. The economy shrank 3 percent in the first quarter of 2014." What liberal economic policies did Bush sign into law? Never happened. The economic collapse began in 2006 with the first signs of the mortgage bubble raising its' ugly head. We lost 8 million manufacturing jobs under Bush, who hid them by growing the size of government through privatization. Contractors do not show up when you count up total government employees. More than one million of your food stamp customers are full-time employees at Walmart. Explain that. The old... 'that is from an old study'. I heard that argument already regarding the gun issue. Is is NOT from an old study, it is from the fact that some states pay into the system and some states take from the system. The red states, especially those in the South, consistently rely on the Federal Government to subsidize them. While most blue states pay more in (you know, the socialist, welfare, nanny state blah, blah blah... another republicant talking point with mno basis in fact). It isn't from 'some study in 04'. It has nothing to do with military bases either (except maybe the fact that many of the troops the righties always talk about supporting, are eligible for food stamps). And 3, just shows the typical avoidance of any intellectual dialogue from the right.... I guess this some 'code' that other righties will find amusing or something? It was your most valid argument though... nonsensical and moronic though it was, it beat the heck out your 1 and 2 arguments which were just BS. The original conspiracy theory about so many "non-payers" started when an early poll found many people whose insurance had not started yet, of course had not paid, as expected. After this changed, naturally, the tin foil hats hung on to the empty talking point. And the small percent that need to pay and don't will get cancelled. That's kinda how insurance works. No big scandal.